This toy is unusual in many ways. 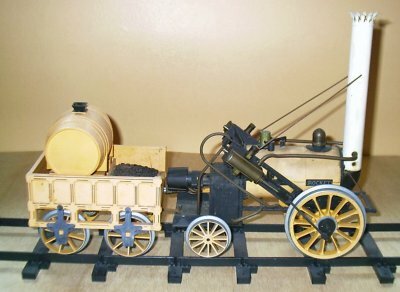 It's 3.5" gauge is rather unusual in the toy market. It is detailed to an extent that it's on the borderline between toy and model. As can be seen in the photo on the left with the smokebox removed, the boiler is hidden inside a much larger dummy shell. 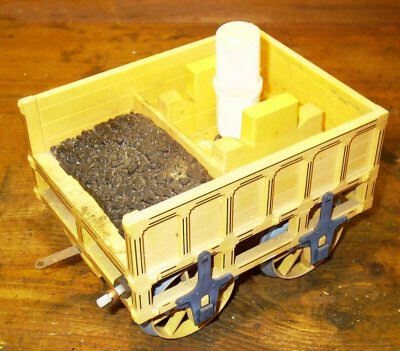 It is gas fired (more common now but highly innovative when this engine was made). The gas supply is a small cylinder hidden inside the dummy water barrel in the tender. 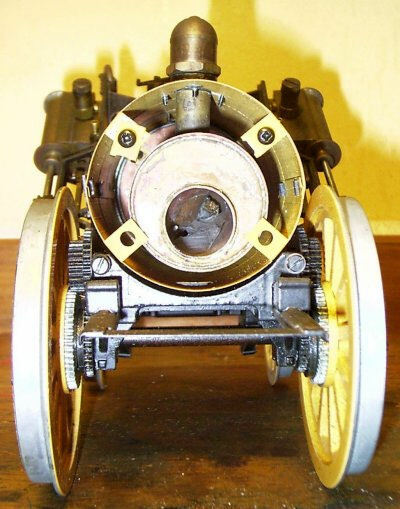 The con-rods, although appearing to be directly coupled to the wheels, in fact, drive concentric shafts through reduction gears. The plastic track supplied with it is designed in such a way that it can be either straight or curved depending on how it is assembled. 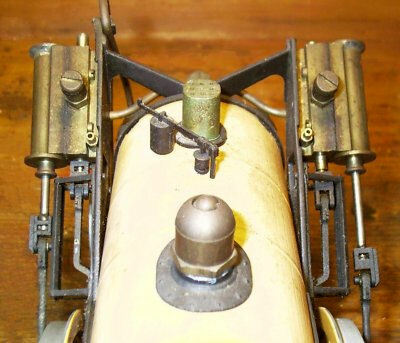 The gas burner is a rather large ugly contraption attached to the back of the dummy firebox. It looks like an afterthought, which it may well have been. 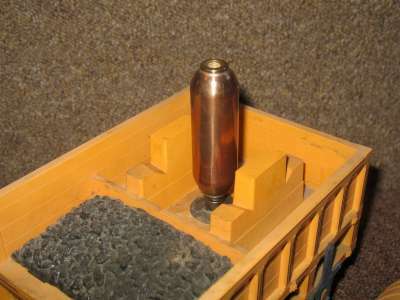 The burner nozzle is pointed into a single 7/8" flue pipe traveling the length of the boiler, which, itself, is approx 1 5/8" diameter x 4 1/4" long, hidden inside the 2 1/2" dummy shell (see photo). The flue has large dents in it at regular intervals along it's length, presumably to increase it's surface area. Steam is fed via slide valves to the characteristic inclined double acting cylinders (approx 1/2" diam x 1" stroke). The slide valves are controlled by independent slip eccentrics, one on each wheel, so that the direction of running is determined by the initial push. The fact that each valve has its own slip eccentric has the interesting consequence that the engine can be disabled by turning one wheel forwards and the other backwards. What's even more interesting is that this practice is recommended in the instructions! The overall dimensions are 16" length x 11" height x 5" width. As acquired, it was still fitted with it's original plastic gas tank. Unfortunately, these are notoriously dangerous because the plastic becomes brittle with age. Fortunately, there are modern metal replacements available and I use one of these for running (see the last photo).